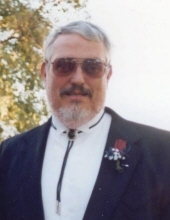 Stephen Lynn Floyd, 62, of McLoud OK, passed away November 28, 2018 in Shawnee, OK. He was born December 4, 1955 to Gerald and Marie Floyd in Mangum, OK. Stephen was a registered nurse and worked as a medic in Marshall County, where he also served as a reserve deputy. He married Carolyn Bynum on September 19, 2003 in McLoud, OK. He enjoyed volunteering for the twelve step program with the Salvation Army. Stephen loved raising cattle and was a longtime member of the Oklahoma Cattlemen’s Association. He was an avid gun collector and ammunition reloader. Stephen also enjoyed spending time with his family and adored his grandchildren. Stephen is survived by his loving wife, Carolyn; mother, Marie Floyd; children, Dustin Lynn Floyd, Talon Ray Floyd, Adam Scott and his wife Wendy, and Michael Scott; 3 grandchildren, Peighton Floyd, Bailey Scott, Grant Scott; brother, Phil and wife Sonja Floyd; nieces, Krystal George, Destinee Damron; and nephew, Adrian Damron. He was preceded in death by his father, Gerald Ray Floyd and sister, Sheryl (Damron) Magoch. Viewing will be 12PM-8PM Saturday and 8AM-8PM Sunday. A funeral service to celebrate Stephen’s life will be 10AM, Monday, December 3, 2018 at Barnes Friederich Funeral Home Chapel with 3PM burial at Willow Cemetery in Willow, OK.
To send flowers or a remembrance gift to the family of Stephen Lynn Floyd, please visit our Tribute Store. "Email Address" would like to share the life celebration of Stephen Lynn Floyd. Click on the "link" to go to share a favorite memory or leave a condolence message for the family.